Word processing is like a day-to-day activity for every computer and/or smart phone owner, you can hardly go a full day without fiddling with one document or the other. There are lots of default word processing software/apps that comes with almost every electronic gadget in the market today but the topic of today is about listing the very best 10 of the word processors. Microsoft Word is a multipurpose word processor that comes pre-installed with most computers and Windows mobile powered gadgets, smart phone and tablets. It features a comprehensive toolkit for creating, editing, formatting and designing office documents to test. It works across all popular operating systems (OS) and has lots of add-ons to increase productivity. The price for Microsoft word or office suite software and/or application depends on the platform is it being installed. It is a premium software and so goes for a price. Curious to know the best word processor application available out there for your device? Well, let us enlighten you with this Top 10 best word processing apps. Openoffice.org is our indisputable choice for best free word processing app across all platform and devices. The software made our cut for the best word processing apps for Mac and is still our best option for word processing on any other operating system. HP Deskjet 1515 All-in-One Printer Review: Cheap but Inferior! It is an open source project and so goes for free and supports graphic editing and logo design with the draw tool that comes bundled with it. You can download a copy free from http://www.openoffice.org. Office Suite Pro is the premium version of the Office Suite app that lets you do word processing on mobile devices. In our humble opinion, it is the Best Word Processor for android and works great on iOS, Windows Phone and Blackberry 10 devices. The free version (Office Suite) works great but not as much as the Pro version that makes creating word and PDF document easy and fun. The Office Suit is available for all apps store and goes for around $10. Kingsoft Office from Kingsoft Software Inc. is another good word processor that makes word editing look premium. It is free on Google Play store and works across all android devices. As a giant app for word processing, there’s a version for Windows, Linux, iOS, Android and blackberry 10 smart phone and/or devices. I was a big fan of Kingsoft Office and used their premium version before their name was changed to WPS Office. It doesn’t matter if you are using the free or paid version of KingSoft Office (WPS Office), it works great on all platforms and can view, edit and create files that’s supported by all desktop publishing software/apps. 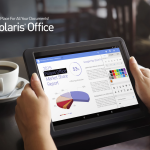 Polaris Office is a default word processing app for most Samsung galaxy smart phone and tablets. It is hands down the best free and user-friendly word processor for android. It works across all mobile operating system and does have the desktop app that helps sync your documents and office works together. The closest in features to Polaris office is evernote which isn’t going to make our list of top 10 best word processors today. Google Docs uses your Google account to create, edit, sync, format and view word, spreadsheets and PDF documents. It is a perfect word processor for those that travels a lot. Documents To Go® is another good app to create, view and edit documents that’s 100% compatible with top desktop publishing software on mobile. It is available for Blackberry, Android, iOS and Windows phone. You can download from your phone’s apps store or select a compatible version from their official website. Libre Office is a forked version of libreoffice.org with added features and improvements, it is aimed at giving you all the features that you need for office productivity at no cost. Libre Office is a superior free word processor that can be compared with any other premium office processing apps and/or software out there. It is free and works seamlessly with the popular operating systems (OS) around. Download a copy from libreoffice.org. This application is simple but functional, doesn’t give a damn with flashiness, but will give you all the basic navigation that you need for a word processing application. Looking for a perfect writing companion for your mobile phone? Werdsmith is the right app for those who are always on the move, because of its cloud-backed support service, your creations are always safe. It is also packed with premium sharing features wherein other writers or non-writers can post feedback on your creations.